Once you’ve got an established customer base for your SaaS product, your focus shifts from retention to growth. In order to successfully and sustainably grow your SaaS company, you need to increase your revenue per customer. There are two main ways to do this: raising your prices, and upselling to your customers. Today I’m looking at why upselling is essential for the long-term growth of your SaaS company. 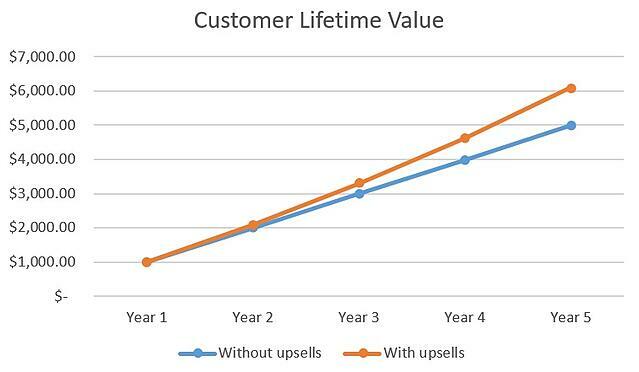 If you don’t upsell to your existing customers, they’ll be paying the same in year 5 of their relationship with you as they were in year 1. To keep it simple, let’s say they pay $1000 a year for your service – that’s $5000 over a five-year period. In contrast, let’s say you upsell so that your customers pay an additional 10% year-on-year, over the same five-year period. In year 1 they’ll pay $1000, but by year 5 they’ll be paying $1464. Over five years that customer will pay $6105 – an increase of more than 20% on their customer lifetime value. Learn more about how upselling impacts your customer lifetime value. In Example 1, the only way to increase your revenue is to have an increasing number of customers, year-on-year. If a customer churns, it hits your revenue hard. In contrast, in Example 2, you can increase your revenue by upselling to your customers. For example, if 10 of your original customers churned, but you’ve upsold to all of your renewing customers, you’ll only need to attract 1 new customer to maintain revenue levels. Therefore, if you were able to attract 10 new customers like in Example 1, this would give you an additional $9000 in revenue, which is an increase of 9% from year 1. While these examples have been massively simplified, they highlight how upselling to your existing customers can boost your revenue, and offset the impact that churning customers have on your recurring revenue. In reality you’ll only upsell to a percentage of your customers, but you should be aiming for negative churn, where the revenue you’re generating from your existing customers through upselling or cross-selling is greater than the revenue that’s lost through customer churn. We’ve said it before, and I’ll say it again: you’re under-priced. Think about it – you’ve spent the last twelve months developing your SaaS product, adding new functionality to make it easier for your customers to achieve their Desired Outcomes and be successful using your product. If your customers are paying the same as they did twelve months ago, that means you essentially did all that work for free. Now, we’re not saying that your pricing should be determined by your costs, but it’s important to remember that if you’ve added new features or functionality, your customers will be happy to pay more for them - after all, you’ve increased the amount of value they can get from your SaaS solution. © 2018 Cobloom Limited, All Rights Reserved. Cobloom Limited, a company Registered in England & Wales: 08272586.